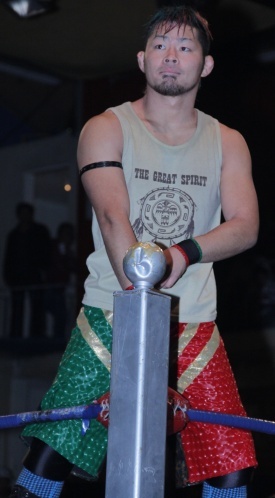 Dragon Gate trainee who was dropped off in IWRG in 2012 for more training. Known originally for his hard chops and a green drum he often uses as a weapon (which disappeared along the ways.) Mostly a rudo in segundas, but traveled the indies to strong acclaim and made a name for himself in DTU. Briefly appeared in AAA as a member of Perros del Mal. Returned to Japan in August 2013. This page was last edited on 26 December 2018, at 10:31.